​In today’s Gospel, we hear again the immortal words of Jesus in relation to the woman caught in adultery: ‘Let the one who is without sin cast the first stone.’ Even though we are sinners ourselves, we may have cast the stone of judgment at others. As we call to mind our sins, we might remember especially the harsh and unfair judgments we sometimes pass on others. it becomes the throned monarch better than his crown. It is enshrined in the hearts of kings. It is an attribute of God himself. that in the course of justice none of us should seek salvation. to render the deeds of mercy. ​The fourth Sunday of Lent is Rejoicing (Laetare) Sunday, named after the opening antiphon: “Laetare, Jerusalem, et conventum facite, omnes qui diligitis eam.” (Rejoice, Jerusalem, and come together, all who love her). Traditionally, this Sunday has been a day to relax the rigor of Lent and encourage one another to press forward along this strenuous walk toward Easter. The rose vestments, the joyful songs, the presence of flowers in some churches… are a visible manifestation of the joy with which the Church seeks to live this day. However, nothing in the liturgy is quite so joyous, encouraging, and uplifting as the readings. In the first reading, we hear of the arrival of the People of Israel to the promised land on the 10th of Nissan, the first month of their calendar. Exactly 40 years before, also on the 10th of Nissan, they started the preparations for the Passover feast and their departure from Egypt. Back then they were slaves, but now they are free and can finally see the promises of God fulfilled. Similarly, in the Gospel we hear of someone who has arrived at his destination after a long way. This young man had left his father’s house in search of happiness and freedom, but found instead rather the opposite: vice, hard labour, and an utter indifference from others toward his suffering once he became poor and needy. So, he decided to return to his father’s home, and there he found the happiness and the freedom he had sought—that which only his father’s unconditional love could give. His journey brought him back to the very place he started, but internally he went a long way to a place where, in fact, he had never been before. We, too, have a demanding and long spiritual journey, but those two experiences help distract our attention from the sacrifices and penances and set our minds and our sight rather on our destination: Easter. So, let us press on with eagerness and enthusiasm, hoping that this year’s journey may also take us to a place where we have never been before. ​In the Gospel of Luke, Jesus’ work centres around a formula for healing the world: a conversation, a reconciliation of the past, and a healed continuation of life. The story about the barren, sickly fig tree in a vineyard illustrates that process. The earth around the fruitless tree will be turned and manured once more in the hope that the next season fruits will be produced. All kinds of things are done to make the tree fruitful, but, in the final instance, the outcome depends on the tree. If that fig tree remains insensitive and unresponsive to all the care it is given, and it still produces no fruit, then the tree is past hope. Alas! In the first reading of this second Sunday of Lent, the Church looks at the first covenant God established with Abram. A few years before that event, Abram had left his town, Ur, at the age of 75, together with his wife Sarai, being childless and having nowhere to go. But at a certain point in their journey, Abram needs a sign from God that he will fulfill his promise and give them a son and a land in which to settle and be buried. This is when today’s first reading begins. God gives Abram a sign, and more than that, God makes with him a covenant. Scholars have been debating the meaning of these Old Testament covenants for much longer than anyone can remember, and the debate is still open. However, most of them would now agree that covenants are liturgical rites performed to unite two parties in a familial relationship. In our times, a wedding would be the closest rite we have to these Old Testament covenants. In the first reading today, God asks Abram to split some animals in half, as was the custom, and prepare them for the ritual. But something unexpected happens. Abram would not pass through the animals, only God would do it, to indicate that this covenant is the initiative of God and that He alone would take all responsibilities. Through history, God has established covenants at different times and with different people with the intention of bringing humanity ever closer to himself. The last covenant to be made was Christ’s. In Him, God was not only expressing his desire to establish an unprecedented relationship with humanity, but he was also making that relationship possible. Easter is the great celebration of that ultimate covenant that opened the gates of heaven for us. Let us prepare ourselves well during these days, so that we may celebrate it eagerly and meaningfully. ​Lent is a season of penance, growth, and renewal. It leads to the celebration of Easter: The resurrection of Jesus Christ, true God and true Man. As individuals, and as a community, we need such seasons in our lives. The Church in England & Wales is committed to the safeguarding of minors and persons at risk. We have structures in place to deal with allegations past and present. Each parish and diocese have named persons who are responsible for overseeing and implementing this commitment. We need to listen to the accounts of those who are survivors. We pray for their healing, justice, and renewal. We pray for ourselves, that we may be more aware, more vigilant, and better informed of the consequences of this crime, which, though it exits in every society, in every culture and people, strikes at the heart of our Christian message. May our Lent be fruitful, in word, deed, and prayer. May the Church of Christ be a safe home for all God’s Children. ​This coming Wednesday, we start our Lenten journey towards Easter. A journey marked by signs of conversion and repentance. A journey that will prepare us to celebrate more meaningfully the mystery of Christ’s death, resurrection, and ascension into Heaven, as well as the descent of the Holy Spirit at Pentecost. The Church offers us an itinerary of forty days, but this is not to encourage us to leave conversion for the last minute, as the prophet Joel reminds us in the first reading of the Mass for Ash Wednesday: “Now, now–it is the Lord who speaks–come back to me with all your heart; fasting, weeping, mourning." St Paul in the second reading writes, quoting the prophet Isaiah: “At the favourable time, I have listened to you, on the day of salvation I came to your help. Well, now is the favourable time; this is the day of salvation.” The favourable time, the right time to come back to God, is today not tomorrow. This time of Lent, originally designed to accompany and prepare those who were to receive Baptism at Easter, still rings with notes reminding us of our Baptism. Indeed, the celebrations of Easter would have no effect in us if we were not united to Christ in some way. In the waters of Baptism, we died and were buried with Christ. We drowned–as it were–our sinful selves and rose again together with Christ to a new life of virtue and faith, symbolised by the light of the baptismal candle and the white garment we put on. So, we not only need to prepare ourselves to celebrate and participate in the mysteries of the life of Christ, but we also need to get ready for our public and solemn renewal of our baptismal promises and the profession of our faith at Easter Sunday. Let us all come and receive the ashes this Wednesday, asking the Lord for a spirit of repentance, a deep desire for conversion, and fortitude for the battle against our sinful ways, so that we may be prepared for the Easter celebrations. Taking for ourselves the words of St Paul: “Get rid of the old yeast so that you can be the fresh dough, unleavened as you are. For our Passover has been sacrificed, that is Christ, let us keep the feast, then, with none of the old yeast and no leavening of evil and wickedness, but only the unleavened bread of sincerity and truth." Because of his greatness on the battlefield, David was very popular with the people. As a result, Saul saw him as a threat and sought to kill him. The first reading contains the moving story of how David had an opportunity to kill Saul, but refused to do so because in his eyes Saul, as King of Israel, was a sacred person. This passage prepares us for the Gospel, which contains Jesus’ injunction to love our enemies. Jesus goes on to stress the obligations of fraternal charity. The ideal of love to which his followers must aspire is that of God himself. We are to love as God loves. Jesus’ vision of human behaviour is at such variance with the view most people have, that many people regard it as humanly unachievable, and therefore ignore it. From a human point of view it is unachievable. in a quite absolute, final way. what seizes your imagination, will affect everything. and it will decide everything. or as Jesus said. Blessed, happy are you who are……. During their visit ‘ad Limina Apostolorum’ with the Pope, the bishops of England and Wales asked Pope Francis for a message that they could bring back to their dioceses. The Pope answered their request very simply: “that we are to live the gift of our faith with joy." Joy is the supreme good. We may experience poverty, discrimination, failure, the loss of property or people we love… but we can more easily live through all that if only we have joy in our hearts. Even for Qoheleth--by far the most critical and gloomy character of the whole Bible--life is worth living only because of the joy of family, of seeing the fruits of one’s work and of sharing your life, time, and food with good friends (Eccl 9:9; 3:22; 2:24). Other biblical witness, however, affirms that there is an even greater joy in praising God in the liturgy. The liturgy is like an open door that allows us to have a glimpse into the infinite, the eternal, the divine… heaven. In the liturgy, we experience both the loving presence of God and the fellowship of the brothers and sisters. (Ps 33:1-3; 133). There is an even greater joy, though: the joy of having an encounter with Jesus Christ. John the Baptist leapt for joy when--still in the womb of his mother--he heard the greeting of Mary, who already carried in her womb the child Jesus. Mary herself was told by the angel Gabriel that she ought to rejoice because she would be the mother of Jesus. And with them, so many other men and women who experienced Jesus’ love and power to forgive and to heal. (Mk 2:1-12; 5:1-20; Lk 5:17-26; Lk 8:1-8). A joy that comes not so much from being freed of one’s ailments but from realizing that in the person of Jesus Christ, God has chosen us from among all the other people and called us to participate of his Kingdom (Col 1:11-14). This joy does not fade when trials come; rather, it increases because the result of suffering is a deeper and more meaningful relationship with our loving God as well as an increase in faith, hope, and charity (Rm 5:3-5; Jm 1:2-4). ​Let us rejoice, then, for having received the greatest gift of all: meeting the person of Jesus Christ in our lives. 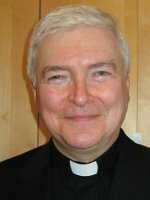 ​As we gather in Rome for our visit ‘ad Limina Apostolorum’, we have spent time together reflecting again on the impact of the recent reports containing stark revelations of child sexual abuse within the Catholic Church, including in England and Wales, and of evident failures of local leadership. We have also reflected on the practical steps we must take. We do so in the light of all that has been achieved since the Report of Lord Nolan in 2001. We have endeavored to build a culture of safeguarding within the Church’s parishes and religious communities in England and Wales, thereby providing a safe environment for all. In every parish, there is a Parish Safeguarding Representative. In every Diocese, there is a Safeguarding Coordinator and a Diocesan Safeguarding Commission, composed of experts in the main disciplines needed for effective safeguarding. We have established the National Catholic Safeguarding Commission (NCSC), with a strong majority membership of experts, independent of the authority structures of the Catholic Church. Much has been achieved. Much is to be learned. Today, 24 September, 2018, we have decided to ask the NCSC to commission an entirely independent and comprehensive review of the safeguarding structures that currently operate within the Catholic Church in England and Wales. Importantly, we will seek to ensure that the voices of the victims and survivors of abuse, through the Survivors Advisory Panel established by the NCSC, fully inform the review and its recommendation. Each bishop has decided that he will take steps to set aside time for the purpose of meeting with victims and survivors of clerical abuse who live in his diocese. May God guide us during this week and in this work, that the voice of Christ, crying out in those who have suffered, may be heard with compassion and discernment. Copies of the full statement are at the back of the Church. Every Sunday, Mgr Jim Curry provides updates on the parish. Our Lady of Victories Roman Catholic Church, 235a Kensington High Street, London, W8 6SA. Clergy House, 16 Abingdon Road, London, W8 6AF.